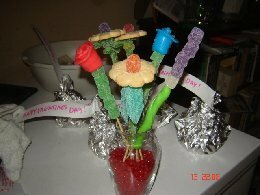 I enjoyed your video with the ideas for Valentine's Day treats. 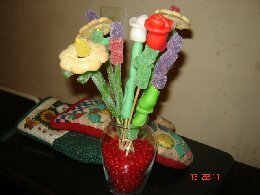 The crispy rice treat as a giant candy kiss gave me an idea. My mother-in-law used to make a version that used peanut butter and the bars were topped with melted chocolate chips. I tried the funnel ideal and it worked great! Heat in large sauce pan to melt sugar. Add 1 cup peanut butter. Pour in 6 cups crisp rice cereal. Coat and pour into pan. Glaze with melted chocolate chips. This was so easy to modify for the candy kiss. 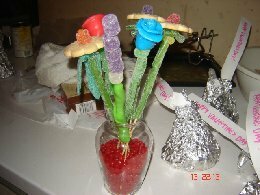 I used the funnel rather than a pan and I un-molded each "kiss" onto a piece of wax paper. I allowed the treats to cool for the next step. I melted chocolate chips in the microwave along with about one teaspoon of vegetable shortening (it aids in melting and setting up the chocolate). I individually spooned the chocolate over each treat and used a spatula to smooth. When the chocolate lost the shiny gloss, I knew that the chocolate had set. 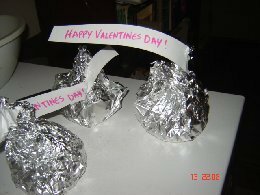 I wrapped the treats in plastic wrap before proceeding with the message strip and foil.